This letter/information sheet accompanied the shipment. The theme this month was inspired by Frida Kahlo and relates to Day of the Dead. I don’t have any beads like this in my collection already, though I do have a lot of red. Always happy to learn about a new shape and to get a color that will work well with other items in my stash. These are so tiny. 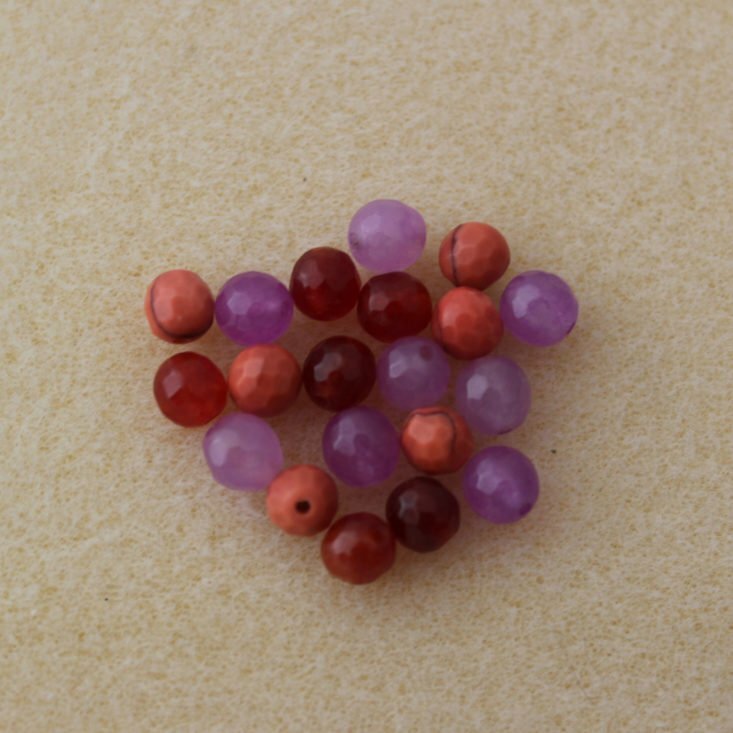 But I am starting to see patterns calling for 2 mm rounds, or these can be substituted for certain seed beads in patterns to achieve a slightly different look. I have a lot of orange in my stash so these will fit right in. Continuing on with this month’s riot of color (not a bad thing at all, I am NOT a fan of neutrals) are some light amethyst firepolished rounds. These do fit in with my standard color palette (basically “things that will look good with copper findings”) but are a little more versatile than that as I can see them working with silver and gold tones as well. 26 gauge is pretty thin so I am thinking I got 24 gauge (still thin, but not as much). At any rate, I have a collection of these little spools in various colors. I am not so great at wire wrapping but it is something I would like to get better at so it is always nice to have more to practice with. You should use nylon tools or coat your tools with Tool Magic prior to working with this as the coating could flake off otherwise. I have always thought cobalt glass was pretty and I bought a lot of it back in the day, so I do have a fair amount of blue that can be used with these. Plus I am just a fan of flat discs. More tiny beads! Anyway, there are a lot of patterns calling for firepolished rounds, including numerous ones I’ve already bought, and I know I have some rivolis in a similar color, so these will probably make it into a rivoli pendant. We get one of these mixes of druks (pressed rounds) in nearly every BeadCrate. I like them for wrap bracelets because the colors go together without matching too much. They’re harder to use in patterns unless you pick out ones that are all the same color. Here is the monthly shaped bead (there is usually one, often 2-hole cabochons or pips but occasionally something else). The obvious use for these is as petals in flower elements, but they could make interesting drops or dangles, too. You’ll usually get one or two charms in each BeadCrate, and they usually go quite nicely with the box theme. This month it is a hand, which is in a position that makes me think of a zombie hand, so it totally works for Day of the Dead. This is small and a good size for a charm bracelet. I am happy whenever I receive bright pink beads. And I need to expand my collection of size 6/0; there are certain things you can do with these (sub for some firepolished beads in patterns, put a jump ring through them, etc.) that you can’t do with smaller seed beads. I like these little guys. I’m not into scary Halloween but I am into cute Halloween, and these for some reason strike me as cute. I think because they are brightly colored and not overly-realistic. I used them in a necklace this month. You’ll usually get some size 11/0 seed beads. This color is actually something I don’t think I already have but can totally use as turquoise is a color that is definitely essential to my main color palette. I tend to use seed beads like this mostly in loomed or beadwoven projects. I have never seen this type of bead before, either. Now I kind of want them in some other colors, too. I suspect there are tons and tons of Czech glass bead shapes I haven’t seen, actually, with more coming out all the time, even though this is something I follow pretty closely. I will have to go looking to see if it is only monkeys or they have other animals too. I think these would look good with some brass findings. Here is a necklace I made using the agate beads and the skulls, along with some black chain and findings from my stash. Whenever I see little skulls like this (and I get some about once a year), I just feel the need to use them, which is a little out of character for me, but I think I am just responding to the variety of colors. This was a pretty simple piece to make but I think it will be fun to wear. Verdict: I did not calculate a value for BeadCrate, as explained above in my note about prices. If you divide the cost of the box plus shipping by the number of items (I counted 14), you get about $1.71 per item. I loved all the bright colors this month and appreciated that there was a Halloween-type theme without being all black and orange. Can you still get this box if you sign up today? No, your subscription would start with the November box. Destash items and excess inventory (and sometimes whole boxes) may occasionally be available in the BeadCrate Etsy shop. Value Breakdown: At $23.99 for this subscription (counting shipping), you are paying about $1.71 per item. What did you think of the October BeadCrate? Do you subscribe to any beading or craft boxes?